(NaturalNews) Chris Gibson started developing acne at the young age of 11. He suffered with the skin condition for over 15 years, saying he was well into his 20s when he was cured. In his case, he had cystic acne, which can lead to severe scarring and permanent pockmarks. "Antibiotics... Accutane... [I] tried it all," says Gibson, who often "kept counting on it" to "go away on its own." Yet, he's now been free of his problematic acne for 20 years, saying the simple fix was right in the fruit aisle all along. Apples... yes, apples, were his key for curing his persistent acne. Gibson says he made the connection between the foods he was eating, the antibiotics he was taking and the health of his skin. Then he went on a fruit fast, and everything changed. He explains that it wasn't the kind of fast "you hear about where people don't eat anything. I ate just only apples for three days." On the fourth day, all the breakouts stopped, and his swelling was gone. "I couldn't believe this would work when all of the other things I had done did not." Once he got his digestive system back on track, his acne went away and has not returned. Today, Gibson is the author of Acne Free in 3 Days, which describes his journey and outlines how others can cure their acne by restoring balance in their digestive tract. He's been on numerous television shows and the thousands of people worldwide who follow his healing advice have also been successful. For example, Florida resident Ronald Brown says, "I wish I had access to your book seven or eight years ago! I am 28 now, but when I was fifteen and sixteen I had horrible acne problems. It is an all-natural program and is much healthier for your body than taking prescription medications or putting chemicals on your skin." 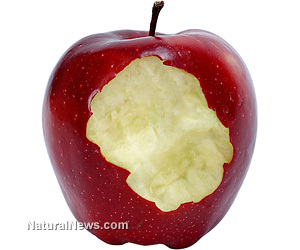 Why are apples essential in helping heal acne? Quite simply, they're brimming with nutrients that keep the skin in good condition. Their fiber content helps keep the digestion tract healthy, in turn removing harmful toxins that can affect skin. Apples also contain vitamins C and A, both of which are responsible for proper skin development. In fact, the Linus Pauling Institute notes that vitamin A may play a role in preventing skin cancer. Vitamin C is responsible for making collagen, which is found naturally in our skin. Finally, apples have a high water content, restoring hydration to the skin. All of these elements, along with a balanced diet, work together to regulate our digestion, balance hormones and reduce infections that can promote acne conditions.